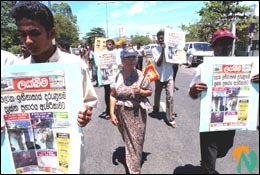 Meanwhile, ŒSriLankaFirst¹ drew very little response in the provincial towns of the north and east, except in Jaffna, despite heavy advertising in the Tamil press urging the people to express their support for peace. One of the organisers of 'SriLankaFirst' said that the Sihala Urumaya had deliberately planned its procession Wednesday to disrupt their campaign. 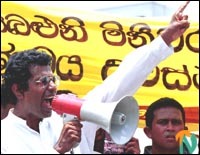 Sinhala nationalists and an influential section of the Colombo press argue and insinuate that Sri Lanka's big business houses are behind the peace campaign for selfish motives and that they are actually aiding the Liberation Tigers by dissuading Colombo from escalating the war to crush the LTTE. No one turned out for the campaign in many towns of the north and east although posters came up during the week, exhorting people to come out to hold hands for peace at noon on 19 September. "The organisers made little effort here, on the ground to get a substantial turnout today", said an NGO official in Vavuniya.